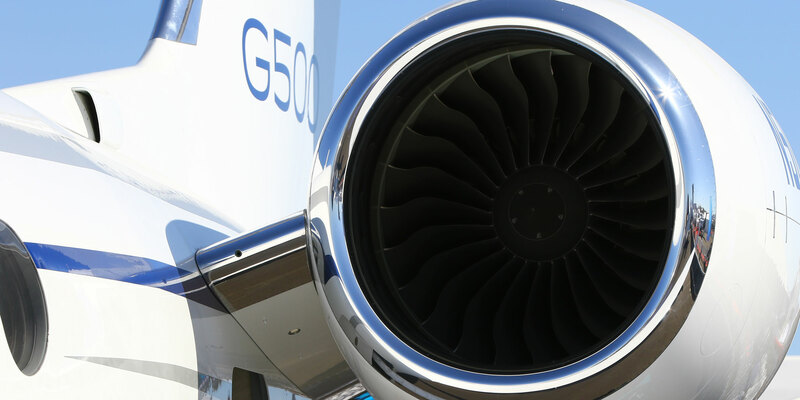 Gulfstream’s G500 will be the first business jet to be certified with Pratt & Whitney Canada’s PW800. The Pratt & Whitney Canada (P&WC) PurePower PW800 engine is nearing entry into service, with the first jet powered by the new engine—Gulfstream’s G500—set for certification later this year. The G500 is powered by the 15,144-pound-thrust PW814GA and the G600 by the 15,680-pound-thrust PW815GA, both of which received FAA certification in February 2017 and EASA certification in August 2017. Recent milestones include reaching 16,600 hours and 16,800 cycles during ground and flight testing in P&WC’s flying testbed and the G500 and G600. To ensure a smooth process, P&WC (Booth N2133) has been training support personnel and stocking parts. Training has been provided to more than 150 frontline representatives, according to the company, 90 percent of spare parts are stocked and technical publications—thanks to collaboration with Gulfstream—are ready for upcoming maintenance and operations. The PW800 engine’s first shop visit should not be needed until reaching 10,000 hours, and on-wing maintenance is projected to be 40 percent lower than typical engines in this class, with 20 percent fewer inspections. According to the company, the engine will also benefit from its Digital Engine Services Platform, which enables technicians and analysts to use near-real-time data generated by the engines to proactively address any issues that arise. P&WC is adding its new oil analysis technology to FAST data to deliver an “all-encompassing view of the health and efficiency of its in-service engines,” beginning with the PW306. FAST is currently used on more than 2,000 engines. On the turboprop side, P&WC launched a certified preowned PT6A engine program. This provides buyers of used aircraft powered by the PT6A a one-year/500-hour first run warranty, optional six months free technical publications, credit toward P&WC’s ESP cost-per-hour maintenance program, discounts on FlightSafety International maintenance training and other benefits. P&WC requires that engines in the program pass an inspection program, are maintained by a PW&C-owned or designated facility and are fitted only with genuine P&WC parts.